This Platform Is Dedicated To Young Adults Who Are Doing Exploits In Their Different Creative Fields. Do You Have A Story To Share? Don’t miss out on this exciting event happening on Nov 15th. Are you single and looking to be entertained whilst finding the right partner. 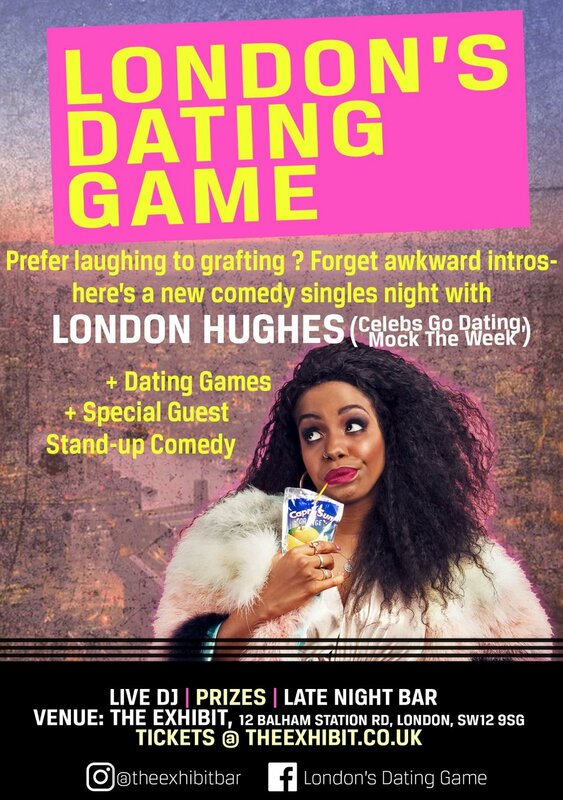 Look no further than London’s Dating Game Hosted by London Hughes with Comedy sets by the hilarious KG the comedian. See ya! As you know, MyRunwayGroup are really passionate about spreading awareness about mental health and big part of our #TheYouthWillBeTelevised campaign, is about mental health awareness. In order to keep this conversation going and keep spreading awareness, we will be having an event along with the charity PAPYRUS. This event is called ‘The Forbidden Conversation’ which will create awareness about youth suicide. This is a great time to come together, gain knowledge and listen to experts and people who have actually been affected. Remember tickets are going quickly! On Tuesday, 19 September 2017, a high category hurricane struck the island of Dominica, moving onto other countries in the Caribbean. This hurricane has left devastating effects, leaving many people displaced and a large number of houses/buildings in ruins. Right now the people of Dominica are in need of supplies and food in order to get through. 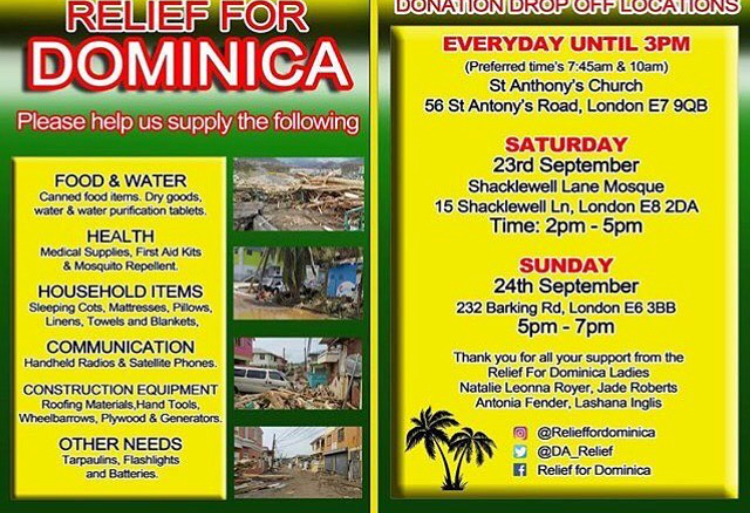 There are places which are taking donations to give to Dominica, so if you would like to donate, feel free to take the items to the addresses above. The picture above also states the items that are of great need, so if you’re able to get any of the items mentioned, please donate. In order to get into contact with the organisers, please contact them via the social media handles above. On the 14th of August, a mudslide took place and claimed the lives of hundreds of people, in the outskirts of Sierra Leone's capital Freetown. The disaster also left numerous people displaced as their homes had been swept away. Many people are still missing and locals are now at risk of contracting waterborne diseases such as cholera and typhoid etc. Dulwich Hamlet FC will have a charity match to raise funds in order to help the people. The day will also include many activities and music. This is a great way to be part of a great cause, to help others in need across the world. The match will take place on Sunday 17th of September. The details of the event are written in the picture above. Do you feel like you aren't sure of how to keep your business going and growing? Are you confused about how to bring more awareness to your brand? Do you feel like you have lost some of the enthusiasm you once had for your business? If this is you, then this event is for you! Bosses in Business is a platform created to help people feel the passion and reasons as to why they started their business in the first place. Many events will be held to give entrepreneurs the much needed advice, help with networking, provide workshops etc. They have an event which is taking place on the 16th of September, which is themed 'Bosses who add value'. This event will feature many entrepreneurs from many different industries who will share the honest journey of their experience having a business and also will give the floor for questions to be asked. There will also be an exhibition where people have the chance of speaking to the business owners. We're back with our youth of the day and today, it's none other than The Compozers! We are also very happy and excited to have them perform at our show which is now just 3 days away! The Compozers are a band with 4 members, who are well known for their live arrangements and renditions of popular songs. The 4 members Stephen (Drummer), Nana Pokes (Bassist), David Melodee (Keys & Keytar) and Charlie Biggz (Keys) were already individual musicians before they decided to merge together. Alongside being musicians, they are also songwriters and producers! They have worked on top charting albums such as JHus' album Common sense which launched May this year, and they are currently working on their own original music. • The group officially started in 2013 and have since achieved so much. • Each year they shut down London by having a massive concert known as 'A Night With The Compozers', which has over 2,000 people in attendance. These concerts take place in well known and respected venues such as o2 Shephard's Bush Empire and o2 Kentish Town. • They have done shows all over the world in Ghana, Nigeria, Los Angeles, Las Vegas, New York, Dubai and Dublin just to name a few. • They have played for many different well known artists such as Wiz Kid, Mr Eazi, JHus, Krept & Konan and many other great artists. • In 2016, they had the amazing and wonderful opportunity to play at the one and only Lauryn Hill's concert after being invited by her herself! As you can see The Compozers have done a great deal of exceptional work and they are continuing to do great things. We couldn't be more honoured to have them perform at our show as they have an amazing energy that they bring and they really give the audience a musical experience that will remain in their memories. We are going to be awarding them a Youth Excellence award on Sunday. An interesting play called Sirens will be taking place on 8th and 9th of September. This play follows the friendship between 3 women who eventually come to a roadblock in their friendship, which then requires them to take sides in the friendship. Sirens also delves into the dynamics and hierarchy of friendships, balancing work and leisure and also how it is being a young black woman in today's society.